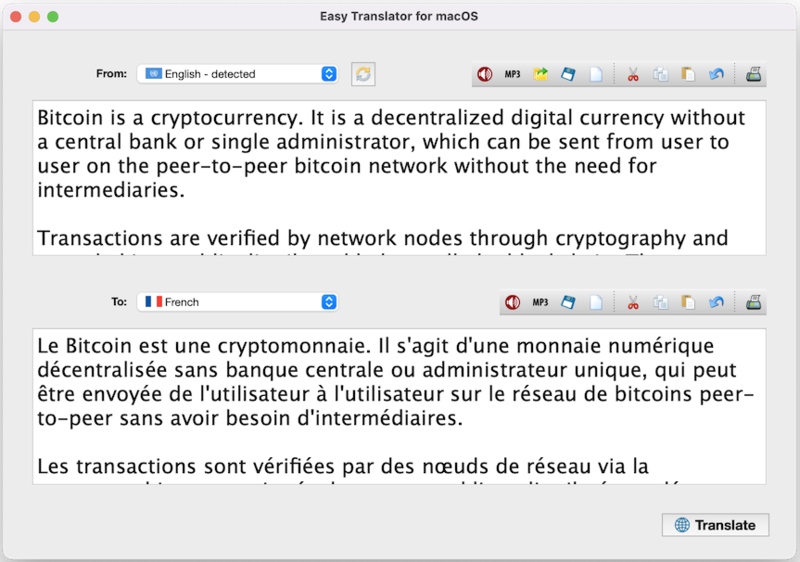 Easy Translator for macOS employs the power of Internet machine language translation engines, and enables you to easily translate Web contents, letters, chat, and emails between major International languages. The new version 12 supports translation between 91 languages, and with text-to-speech (TTS) support for 46 languages, which makes it an ideal language learning app as well. For the Chinese language, Easy Translator now supports two spoken dialects: Mandarin and Cantonese. Easy Translator supports translations between the following 91 languages. Languages marked with have TTS feature enabled. Mac Translation Software, French Translation Software for Mac OS X, Greek Language Translator for Mac, Korean Chinese Japanese language translation software for Mac, German Italian translation software for Mac, Russian Portuguese Spanish language translation progam for Mac OS X, Persian Farsi Arabic Hebrew translation software for Apple Macintosh. Hindi Polish Dutch Portuguese translator for Mac. Foreign language translation software for Mac OS X.